According to United Nations, since early June 2012, more than 100,000 Muslims have been displaced by volatility in the west of Burma. Thousands of homes have been burnt. 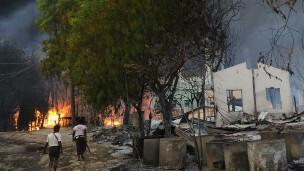 On June 10, President Thein Sein issued a state of emergency in the area, which is continuing. It has been reported that thousands of Muslims have been killed. About 800,000 Rohingyans live in the province of Arakan, West Burma, and according to the United Nations, they are described as one of the worlds’ most persecuted minorities. Food supplies are urgently needed for more than 66,000 people in order to save hundreds of lives, according to the United Nations World Food Programme (WFP).